There you have it. The Academy spoke loud and clear this morning and revisited truths we already knew and perhaps had forgotten, and also gave us another glimpse into the future of this changing body. The Netflix-distributed, Mexico-produced white and black, Spanish language movie Roma led the day with ten nominations, in itself a historic feat. And a Marvel comic book movie, Black Panther, snagged a Best Picture nomination for the first time ever, along with six other awards. Those two were joined by other awards-season repeats in the eight-movie Best Picture lineup that included A Star Is Born (with eight nominations), The Favourite (coming in strong with ten), BlacKkKlansman, and Vice. Meanwhile, Golden Globe winners Green Book and Bohemian Rhapsody also made it into the final list, but looked relatively weaker, with only five nominations apiece, and few in the key categories. Notably, both missed out on important Best Director nominations, and Bohemian Rhapsody did not even score a screenplay nod. On the other side of movies exceeding expectations, you can first turn to the leader itself, Roma. 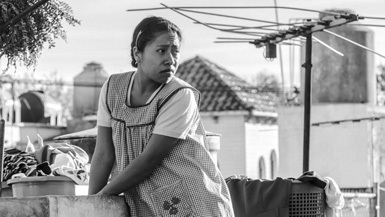 Not only did it land director, original screenplay, and cinematography nominations for Cuarón, it also landed Best Actress, and, stunningly, Best Supporting Actress nominations for its two stars, Yalitza Aparicio and Marina de Tavira, to go along with a bevy of technical nods and what could be Mexico’s first-ever Best Foreign Language Film Oscar. But other movies also exceeded expectations, and among those you can count Poland’s Oscar submission Cold War, which received an expected nod in the Foreign Language Film race but also a Best Director nod for helmer Pawel Pawlikowski, as well as a cinematography nod. It will square off with Roma in all three categories. The Academy also reminded us that there is a strong contingent of Coen Bros. supporters, given that their film The Ballad of Buster Scruggs received three nominations, for adapted screenplay, original song, and costume design. In the acting categories, Aparicio will have to fight off favorite Glenn Close, who was joined, as expected, by Melissa McCarthy, Lady Gaga, and Olivia Colman. Her co-lead, Tavira, will face prohibitive odds against If Beale Street Could Talk’s Regina King, though that film did not do as well as many had hoped, including missing out on a Best Picture nomination. Tavira and King will also compete against two ladies from The Favourite, (Emma Stone & Rachel Weisz), as well as against Amy Adams from Vice, her sixth nomination without a win. The male acting categories were a tad more predictable, with Rami Malek and Viggo Mortensen from the two Globe winning films squaring off against Christian Bale, Willem Dafoe (At Eternity’s Gate), and Bradley Cooper for A Star Is Born. The supporting race features Mahershala Ali, Adam Driver, Sam Elliott, Richard E. Grant, and Sam Rockwell for Vice. Stay tuned for predictions as the season develops and as we go along. Right now, Roma seems to be the prohibitive favorite, but The Favourite did do very well, as did ‘BlacKkKlansman. The latter two, whoever, have not won as many precursor prizes. What happened to A Star Is Born will remain a mystery for now. As for how I did with my predictions, I nailed Best Actress and Supporting Actor, going five for five, and picked all eventual eight nominees (though I also picked a ninth movie that did not get in). I really embarrassed myself with Best Director, picking only two of the five eventual nominees, and in editing I missed all but one of the names read out loud. In total, I went 87/121 for about 72%, my usual score from prior years, and it goes up to 80% if I count alternates.